The presidency isn't won by amassing raw votes. An anti-Trump protester in Oregon, Nov. 10, 2016. FOR AT LEAST the fourth time in US history, the incoming president isn't the candidate who attracted the most votes on Election Day. Although Donald Trump is assured of a sizeable majority in the Electoral College, more individual Americans voted for Hillary Clinton. When all the ballots are finally tallied, Clinton's popular-vote margin may well surpass 1 million. Does that taint the legitimacy of Trump's victory? Not a bit. But that won't stop many Democratic loyalists from lamenting the "undemocratic" outcome of an election that Clinton would have won if presidents were chosen by majority vote instead of the Electoral College. In a Facebook rant after the election, left-wing filmmaker Michael Moore admonished his followers: "You must say this sentence to everyone you meet today: 'HILLARY CLINTON WON THE POPULAR VOTE!'" It's an empty claim. In America there is no unitary popular vote for president, just as there is no unitary popular vote for the House of Representatives. "Republicans captured the majority of the 'popular vote' for the House on Election Day, collecting about 56.3 million votes while Democrats got about 53.2 million," USA Today reported last week. Despite the GOP's 3-million-vote advantage, however, Democrats will control 44 percent of House seats when the 115th Congress convenes. Unfair? Not in the least: Power in the House is determined in 435 separate district-level elections, not one mass nationwide vote. Similarly, control of the presidency is determined not in a single grand plebiscite, but in 51 state-level elections (including the District of Columbia). Trump won 60 percent of those elections: a decisive majority in the only tally that counted. It's easy to score rhetorical points by claiming smugly that "the people chose Hillary Clinton," but the American method of choosing a president has been in place for two centuries. The Constitution is indifferent to national popular voting trends. This is a nation made up of states, not the undifferentiated population as a whole. Those states have different political, economic, and cultural interests — Massachusetts and Arkansas are not interchangeable — and the Founders designed a federal system that respects each state's identity and autonomy. The Electoral College, as part of that system, ensures that voters in a handful of densely populated urban regions cannot hand the presidency to a candidate that a significant majority of the states oppose. Remember, it was the states that created the national government. That's why it takes a consensus of the states, not merely a popular majority, to elect a president or amend the Constitution. That's why we have a Senate, in which states, not voters, are equal — and why that undemocratic Senate is empowered to ratify treaties, confirm judges, and try cases of impeachment. The Electoral College ensures that no one becomes president without commanding the support of a majority of voters in a majority of states. Clinton's popular-vote bonanza may ease her followers' disappointment, but neither she nor Trump campaigned to win the most popular ballots. Their campaigns were explicitly focused on winning 270 electoral votes. 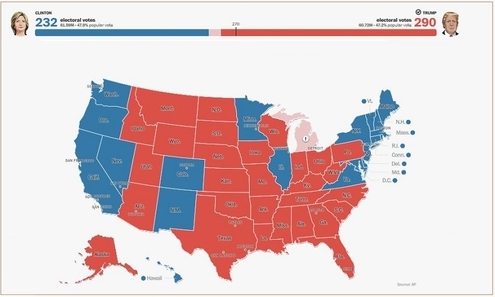 As David French astutely pointed out in National Review the other day, "We don't know who would have won the 2016 (or 2000) presidential races if the president was elected by popular vote because the race would have been run completely differently. . . . Democrats declaring Hillary's superiority aren't unlike sports fans who stubbornly cling to the notion that their team would win if only the rules were just a little bit different." If the World Series were decided by total runs scored, the Chicago Cubs and Cleveland Indians would be sharing the 2016 trophy (each had 27 runs over the course of the seven games). But baseball doesn't work that way. The American presidency isn't won by amassing raw votes. The Constitution was crafted to thwart pure majoritarianism, which the Founders knew was apt to lead to a tyranny of the masses. 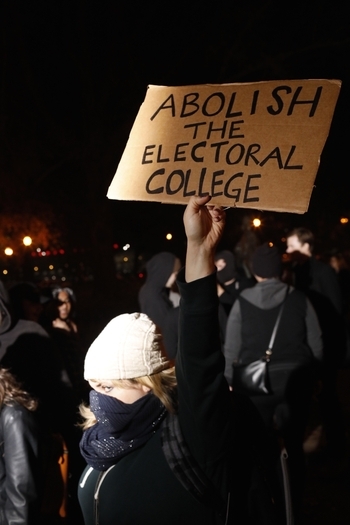 In the immediate aftermath of a bitter campaign, the losing side can be forgiven for not rushing to extol the virtues of the Electoral College. But its virtues are considerable. No one becomes president without commanding the support of many states. It's no guarantee of presidential wisdom, courage, or honesty. But it does confer constitutional and political legitimacy. In a nation as polarized and diverse as ours, that's no small thing.